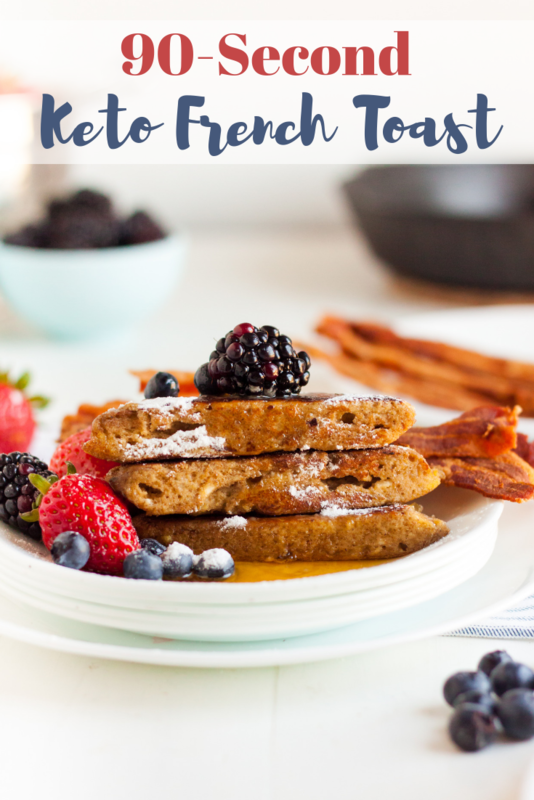 If you want a fast and delicious breakfast that feels decadent, then my Keto French Toast is the recipe for you! This is an excellent variation on the popular keto 90-second bread recipe. 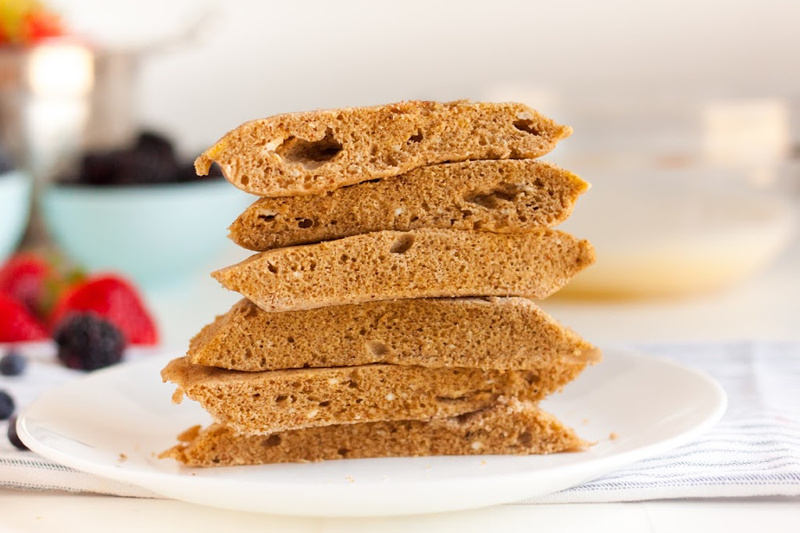 A few tweaks and you have a delicious sweet treat for breakfast that everyone in the family will love! This morning as I was waking up I was thinking about different breakfast items that I might be able to make Keto friendly. While I love my keto biscuit recipe, sausage ball puffs, and pancakes, I wanted to try something different today. Then, I remembered my 90 Second Bread Recipe and thought surely I could change it up to make a Keto French Toast. By the time everyone had tasted I bite, I knew I had a hit on my hands especially when they all asked me to make more, which I happily obliged. 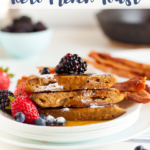 If you’d like to make a big batch of Keto French Toast, check out my family sized recipe here. If you are looking for sugar-free syrup, I love this Lakanto Maple Syrup. 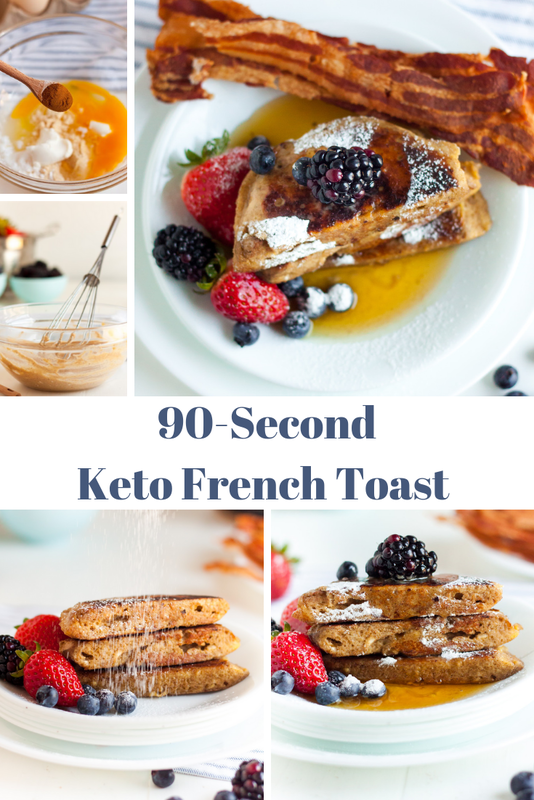 Make sure to use a whisk so that all of the ingredients are mixed up nicely for Keto French Toast. 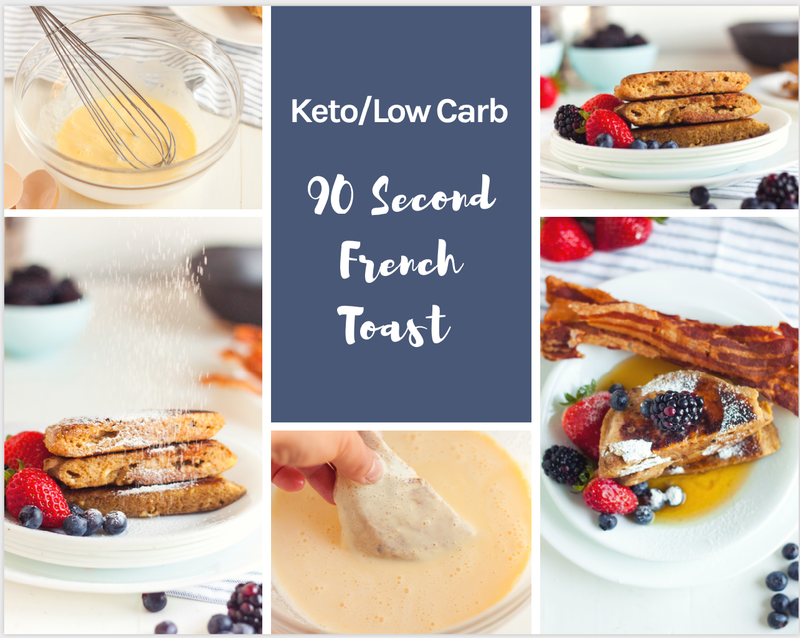 Pop the batter for the Keto French Toast in the microwave for 90-seconds. If you don’t use microwave ovens or don’t have one, I would suggest baking at 350 degrees then check periodically for doneness. You can make a couple of batches at once or, bake this Family Sized loaf of Keto bread ahead of time to make it easier to make enough Keto French Toast for the entire family. 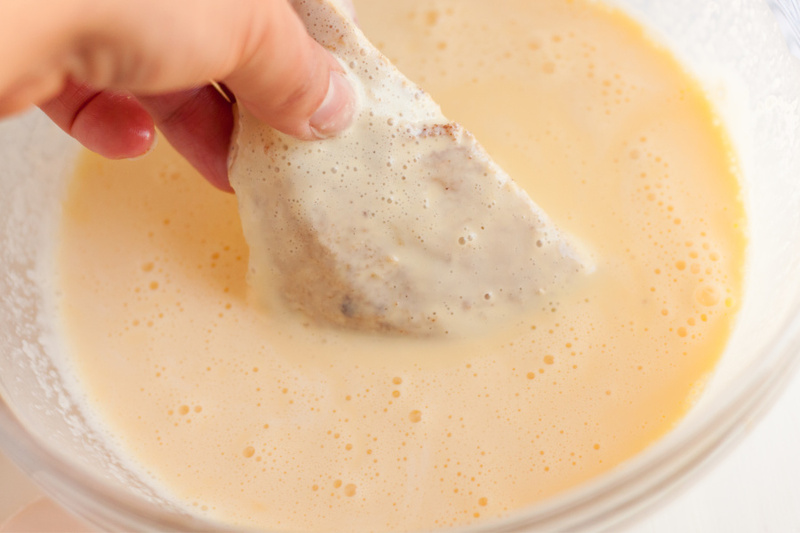 Just like regular french toast, dip the bread into an egg mixture and coat it thoroughly. I use a cast iron skillet to fry the Keto French Toast. If you don’t have one, I have this one and love it. Powdered Monkfruit can be used for a fun topping along with berries and Lakanto sugar-free syrup. Feel free to top however you prefer. I’m telling you, it was so good and filling, I don’t think I will be hungry for a long time. 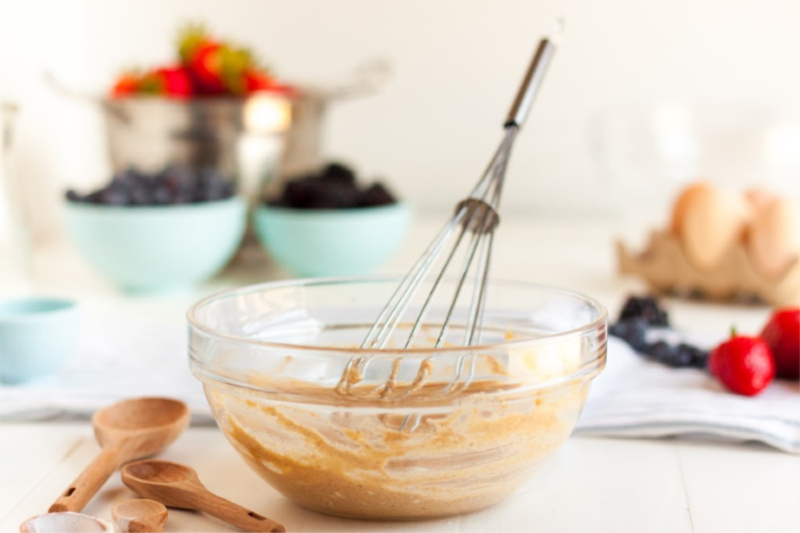 In a flat dish add 1 egg and 1/4 cup heavy whipping cream and combine with a whisk. Soak bread on both sides in egg and heavy whipping cream mixture. Heat 1 tablespoon of butter in a skillet and fry each side until crisp. 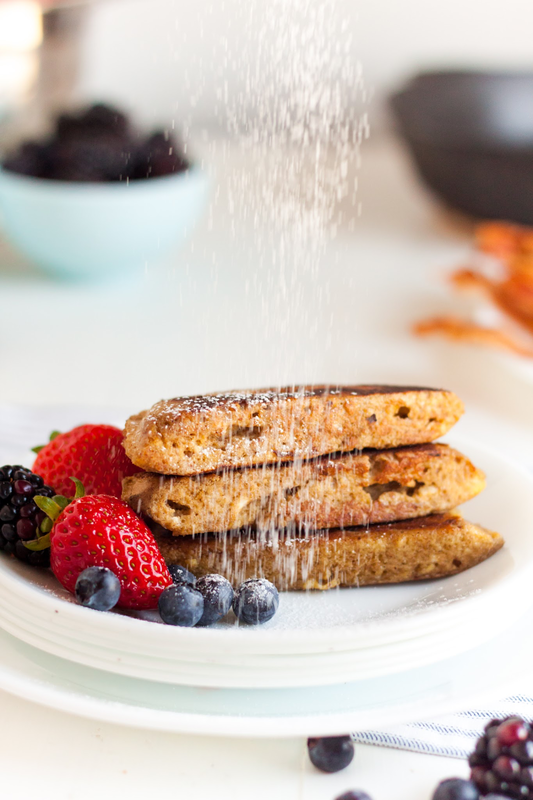 Sprinkle 1/4 teaspoon Swerve Confectioners Sugar on top and serve with sugar-free syrup. 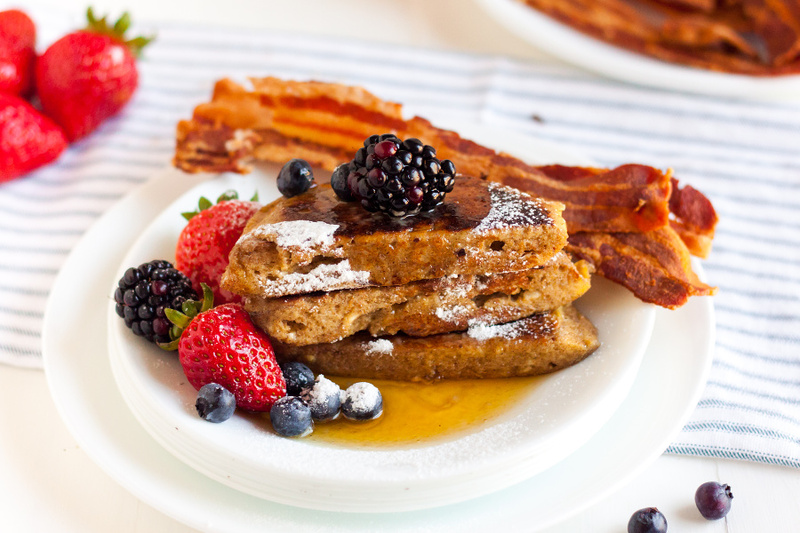 Berries are also delicious with this Keto French Toast. I only included 1 tbsp of the heavy whipping cream in the nutritional information because most of it is left behind. You make more than you need so that you can coat the bread on both sides. Also, the sugar alcohols from Swerve are not included since most subtract to calculate net carbs. I love creating delicious keto recipes for my family. Make sure to check out all of my Keto Recipes in my Keto Recipe Index. I love making over classic recipes to be more keto-friendly. There are so many fabulous Keto Breakfast options there is no need to get bored when following a keto lifestyle. Some of our favorite Keto Casserole Recipes are a must! Of course, my favorites are these Keto Chocolate Recipes! No matter which new recipes you add to your list, you’ll love seeing your favorites remade into a low-carb and keto friendly version. « Kitchenaid Cold Brew Coffee Maker – OVER 50% OFF! Ahhhhh…..I meant cream cheese. Thank you! I’ve updated the post. Does the cream cheese have to be room temp? Seems cold cream cheese would not mix well.. Yes, or you could soften when you melt the butter. I’m confused. How does it get the “bread” shape that’s pictured when you cook it in a bowl? Shouldn’t it turn out rounded? I had a little square sandwich container that I made it in that time. The keto bread is made in the microwave in 90 seconds as part of the recipe. How are you only getting 3 carbs? When I put everything in MFP I am getting 12 carbs and that is excluding the egg/heavy cream. Hmmmm…I’m not sure how you are getting that many carbs. MyFitnessPal is famous for choosing the wrong ingredient or the wrong amount of an ingredient. Also, it doesn’t subtract fiber or sugar alcohols. MFP does not take out( – ) fiber. Yes, it is not a true Keto app, you have to subtract fiber manually. 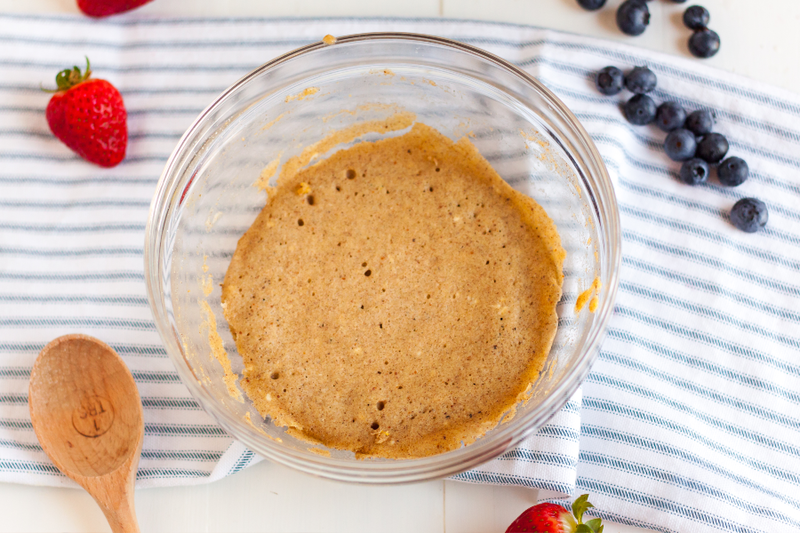 Could I use almond flour? I just don’t have any coconut and want to make this asap! You can, but it’s not a 1:1 substitution. I haven’t used almond flour so I’m not sure how much exactly you would use. I used almond flour and did 4 TBS and it turned out great. I actually liked it a bit better than the coconut flour, which I tried later. Oh man! I just made this! it really blew me away. I ate it hot from the pan with butter and a sprinkling of splenda (i know its bad, dont care!) and it really hit the spot. thank you! i want to marry you now! This was great! Everyone was having french toast, and my mom and I could have our own, too! Thank you! I’m going to try the bread, leaving out the spices, for sandwiches. Made it this today, after reading the recipe. Very good for a quick bread and the desire t have french toast.\! French toast is my favorite thing in the world. Now that I am keto, I miss it. Your recipe is spot on and tames my French toast carvings. It was so delicious. Thank you for publishing and sharing it. I, too, had leftover, so I am saving it for another round. I may decide to add bacon and make it a sandwich I I need more protein. That information is provided in the post under the recipe card. Awesome! When my 2 yr old loved it, I knew I had a winner. Glad you all loved it. Hi! I don’t have a microwave oven. How long should I bake it in an oven? I have only microwaved individual servings so you’ll just have to watch it closely. This was perfection. Thank you so much for the recipe. I almost had a moment of weakness and ate my kids Sunday morning pancakes but found you instead. Truly a lifesaver and a new option for me in Sunday’s! Awesome! Way to stay strong. Glad you enjoyed it. Yummy!! This was as good as I hoped it would be. Topped it with butter and Lakanto maple syrup. I ate it so fast because I hadn’t tasted French toast in a year!! Next time I’ll savor it, lol. Yay! It is one of our favorites! So glad you enjoyed it. Another win!! Didnt notice any difference. Made this today and oh so good!! Kind of reminds me of buckwheat pancakes which I loveeee!! I will definitely be making these quite often. Thanks for the recipe:)))! Awesome! SO glad you loved them! I got lost on the bread portion as well. The directions are poorly written. What specifically are the rest of the ingredients? The rest of the ingredients are listed right above the instructions in the details of the recipe. I’ve only tried the recipe as written as I do not avoid dairy, but it worth a try. Feel guilty admitting it but, with all that extra batter left over, I just threw it in the pan with my French toast and let it cook. I ate all of it and it was delicious. I did not want to waste it. Next time I will probably double my bread recipe and use up all the batter that way. It was really very good. Thank you so much for sharing your recipe! This was excellent as it wasn’t eggy tasting as I have found most 90 sec breads to be. Love how when people pull together and share the wins in life we all win. Keto on babe! This is EXCELLENT! Great job, simple ingredients, quick, low mess. This is the only French Toast recipe I need! Amazing. Seriously amazing. Make eggs and bacon on the side so you get full. I used pumpkin spice instead, and then while it’s in the pan I added more spice to the outside so it looks and tastes better. I poked holes in the “bread” with a fork and let it sit in the egg mixture for a minute to really soak it up. My only issue with this is I want it all the time. Fairly easy to make. Looks amazing!! Can you use regular coffee creamer instead? I’ve only tried the recipe as it is written. Just made this today and loved it! Definitely satisfied my craving for French toast. Next I will sandwich the two halves filled with sweetened farmer cheese and then dip in egg mixture making it a French toast cheese blintz, served with fresh berries! Sounds like a great plan. So glad you loved it. Is there anything I can substitute for the cream cheese? I’ve only tested the recipe as is so I’m not sure. You could perhaps leave it out. I’ve been after a good keto french toast recipe for SO long because ever since I started i’ve been missing it so much! I came across this recipe last night and made it this morning and it was absolutely delicious! I had to leave out the cream cheese because I didn’t have any on hand, but it still came out perfectly! I also topped it with a few fresh raspberries and my keto whipped cream. So tasty!!! Definitely a recipe I will keep making! Husband and I have been eating keto almost 6 weeks. We’ve found some delicious recipes and a few stinkers along the way, so I was a little apprehensive to make this French toast. Hubby is a devout real maple syrup person, so I wasn’t sure how this would work out. Happy to report that he thought it was pretty tasty! Only had some Aunt Jemima sugar free syrup on hand and even that tasted good! Also, I added about 1/2 tsp vanilla to the egg and HWC mixture as I always add vanilla when making regular French toast. Thanks for sharing this recipe! Awesome! So glad you both enjoyed it. Hi ! Made your recipe today and loved it until the after taste came. I think i used a little bit to much nutmeg it really over powered the whole thing and wasn’t able to finish my French toast any suggestions for next time ? If you think you added too much nutmeg then I would omit it next time. My husband loves your French toast! He has it once a week and always says he feels like he’s cheating! So glad he loves it! Thank you so much for this recipe, it was absolutely fantastic! So easy and tastes just like regular french toast. I won’t bother making pancakes anymore, this is a real keeper. Glad you enjoyed it, Margaret. Am I able to refrigerate and eat at a later time? If so, do you know how many days it’s good for? 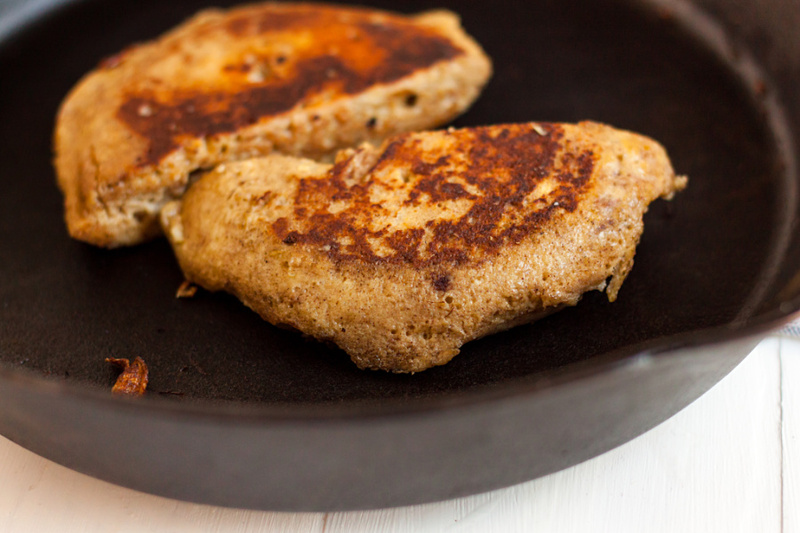 You could refrigerate and wait to fry it in the skillet until right before you eat it. I would say no more than 5 days. Simple, easy to make and tasty. I put whip cream on mine to further satiate my sweet tooth.